Designed for use with the Bosch Click & GO storage system, this Bosch ORG53-RED set features 26 modular organizers (in different shapes and sizes) for keeping items neatly stored and easy to find. 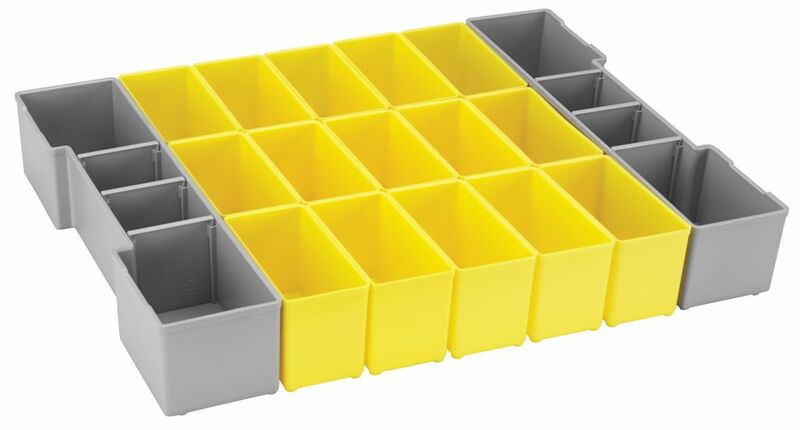 Use the optional organizers to store bits, blades, fasteners, hand tools and more. The ORG53-RED 26-piece set makes a useful addition to the iBOXX53 storage case (sold separately). The Bosch Click and Go storage system is designed to help you stay organized and get your tools on and off the jobsite faster, so you can spend less time setting up and more time being productive. It's the ultimate in customized organization and efficiency. Organize over 90,000 nuts and bolts and house over 100 types of power tools. The Click & Go storage system featuring the L-Boxx is available in 5 sizes, and fully customizable with foam, plastic inserts, drawers, and exact-fit insert trays sold separately. Every L-Boxx quickly fits together with just 1-click stacking. Easily sort and organize multiple accessories, bolts, screws, etc. Large cargo platform minimizes the number of jobsite trips. Easy portability to take cart anywhere for loading and unloading chores. Rugged steel construction ensures cart can withstand large loads, heavy use and heavy capacity. Handles move out of the way for stowing, but are large enough to offer better manoeuverability when in use. Beveled nose plate helps protect cargo from damage from sharp edges. System of 3 storage units and a metal carrier For easy and better grip and carrying the tote. Extra durable 4mm wall thickness structural foam boxes. Robust structure for the stand alone units Integrated water seal in every unit for protection of contents and long life for your equipment Central locking mechanism secures the boxes to the frame. 17 pc. Organizer Insert Set for L-Boxx System Designed for use with the Bosch Click & GO storage system, this Bosch ORG53-RED set features 26 modular organizers (in different shapes and sizes) for keeping items neatly stored and easy to find. Use the optional organizers to store bits, blades, fasteners, hand tools and more. The ORG53-RED 26-piece set makes a useful addition to the iBOXX53 storage case (sold separately). The Bosch Click and Go storage system is designed to help you stay organized and get your tools on and off the jobsite faster, so you can spend less time setting up and more time being productive. It's the ultimate in customized organization and efficiency. Organize over 90,000 nuts and bolts and house over 100 types of power tools. The Click & Go storage system featuring the L-Boxx is available in 5 sizes, and fully customizable with foam, plastic inserts, drawers, and exact-fit insert trays sold separately. Every L-Boxx quickly fits together with just 1-click stacking.